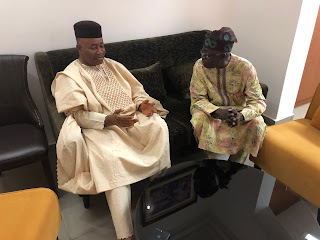 In efforts to consolidate his rumoured defection to the All Progressives Congress (APC) the else while Senate Minority, Senator Godswill Akpabio, Monday, paid a courtesy visit to APC national leader, Asiwaju Bola Tinubu, reports ITRealms. Akpabio, who was the former Akwa-Ibom State governor, until 2015 had been a known Peoples Democratic Party (PDP) for over 18 years. Although the agenda of the courtesy visit with Tinubu was not made open, Akpabio at the weekend visited President Mohammadu Buhari in London. Political watchers have been of the opinion that for Senator Akpabio to thought of defection, he definitely should have a very juicy offer from the APC, which may include option of replacing Senate President, Bukola Saraki, and or his Deputy Senate President, Senator Ike Ekweremadu. Saraki was accused of leading some 15 Senators and over 30 members of the House of Representatives in the past one week. At the time of filing this report, PDP had alleged that APC and presidency are jointly plotting impeachment of Senate President, Saraki and his deputy, with offer of some $1m to each collaborating Senators to support the scheme.